Having left Picton we drove to Blenheim and on to Kaikoura along State Highway 1, which hugs the shoreline along some pretty spectacular coastline. 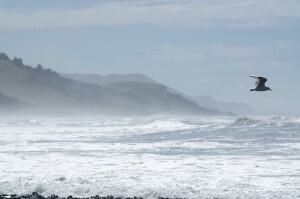 This is the Pacific Ocean so, with nothing between New Zealand and South America, other than the Chatham Islands, quite a swell comes ashore in impressive breakers. Rising steeply from the road are the mountains, the highest of which have snow. 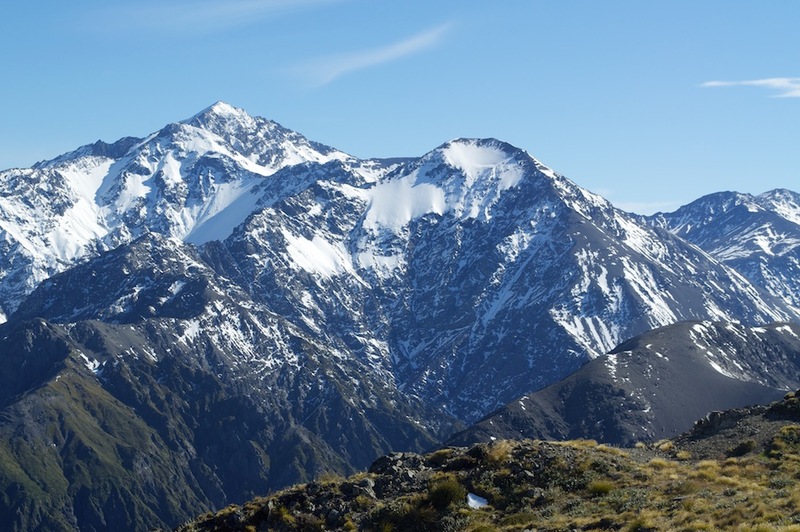 While we were enjoying the beautiful weather up in the Abel Tasman, Christchurch and the surrounding area were experiencing a “once-in-a-hundred-years” storm with severe flooding in Christchurch and snow on the mountains. As we drove to Kaikoura the spray from the breaking sea created a mist in the air making the view more interesting and dramatic. We stopped on several occasions to admire the seascape and to look at seal colonies. Kaikoura, as a town, is a little disappointing. The approach along the road behind the dunes is a mixture of motels and small industrial plots, all rather featureless. The main street is a few shops and eateries and nothing more. The southern side of town is a little more interesting. However, it has gone through a number of boom and bust periods, which have clearly had an impact on how the town has developed. Originally a whaling base and an agricultural centre for the fertile flat alluvial plain behind the town, it declined on both fronts when whaling became less acceptable and agricultural methods changed. It was also a significant railway town but with the decline of the major industries, that also declined. Today, Kaikoura attracts thousands of visitors a year for the whale watching tours which take place several times a day. 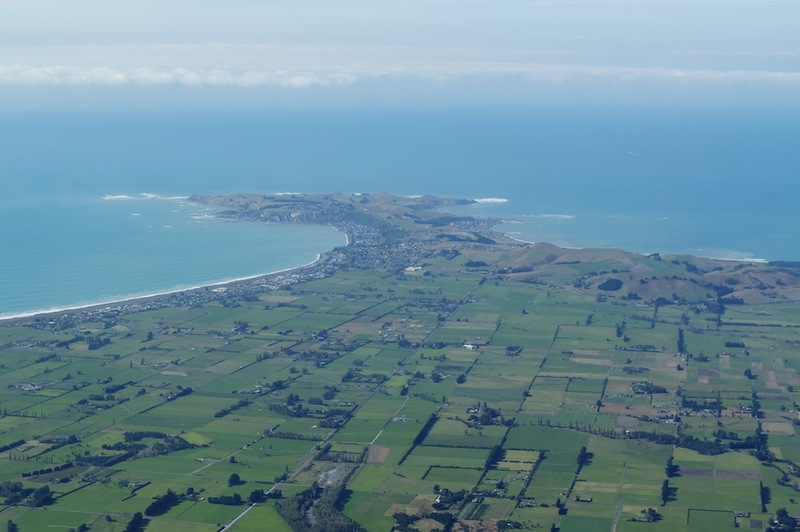 However, that has not been a smooth journey as they were treated with some suspicion by the old whalers in the early days, and the 2011 Christchurch earthquake deterred many visitors from coming to the region, particularly when tour operators advised travellers to stay away. 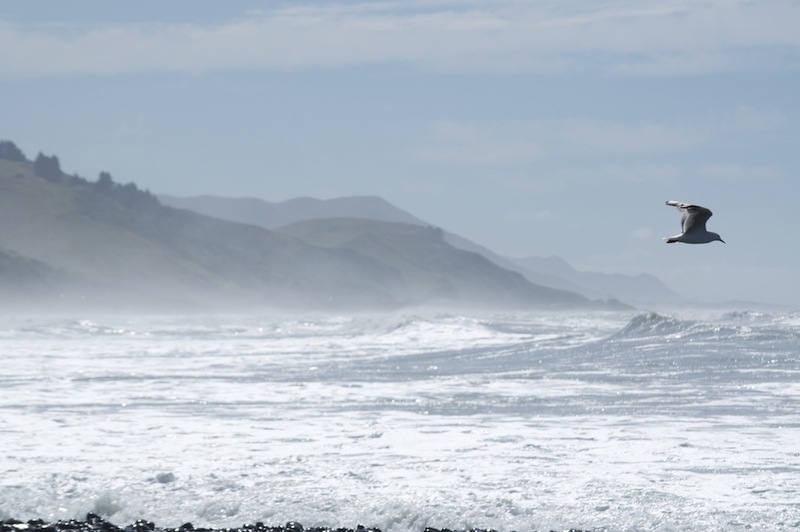 30,000 people cancelled their trip to Kaikoura in the year following the earthquake, and when each tour costs $145 per person, that equates to a huge loss of income. We were booked on a tour at 3.00pm. The weather was good but there was a reasonable swell which meant it wasn’t going to be a particularly smooth ride. 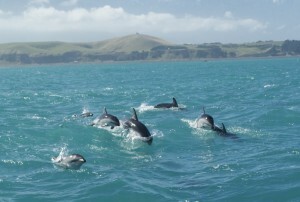 Kaikoura is one of the top whale watching sites in the world. About five miles off shore there is a deep canyon in the continental shelf which leads out to deeper water below the shelf. 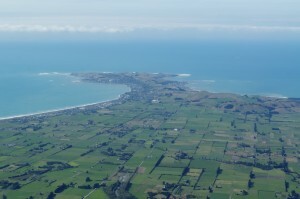 Warm currents flow from the north along the coast while cold currents flowing from the south meet at Kaikoura. That combination means that the canyon is a perfect source of food for whales, particularly Sperm Whales, which are resident throughout the year. Other species including Orcas, Blue Whales and many more lesser known species pass through the area on their migratory route. 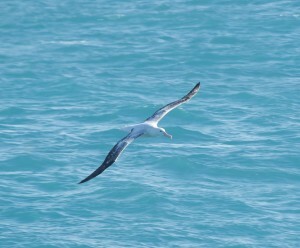 It is not just whales but also dolphins and many varieties of sea birds including the majestic albatross. 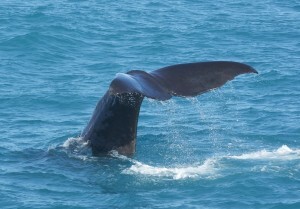 With about forty fellow passengers we set sail for the sperm whale feeding grounds about eight miles off shore. Within a few minutes of leaving we came across a pod of about 200 Dusky Dolphins swimming and leaping all around the boat. They were very difficult to photograph as they moved so quickly and were unpredictable in what they did and where they went. I tried latching on to a single dolphin who would then swim under the boat and entertain the passengers on the other side. It was a remarkable spectacle to see so many and some of those on the edges of the pod were leaping really high and flipping at the same time. It was a privilege to be there, surrounded by such special creatures who clearly enjoyed human company and the challenge of keeping up with the boat. When not watching on deck we were confined to our seats in the cockpit as the boat travelled through the water at about 50kph in its quest to find the whales. As well as the captain there were two lookouts on the bridge and once a whale was sighted we would head towards it at high speed but also making sure that we only approached it from the rear before coming within 50m to one side of it. All the whales we were hoping to see were males as they remain in the area all year while the females migrate with their young to return only when they are ready to mate again. The crew know the local whales very well and their patterns of behaviour. They come up to the surface to re-oxygenate their blood, taking in lots of air and exhaling through their blow hole. Whilst doing this they float on the surface using very little energy. All we can see is the top of the head where the blow hole is, along the back to just beyond the dorsal fin, and not a lot more. The bulk of the animal is below the surface. Ben described it as “log watching”. It was much more than that. The crew were able to tell us in advance to have our cameras ready for the moment when the whale dives. They take a long breath, arch their backs and point their heads down towards the depths. In doing so their tail, or fluke, rises out of the water, majestically, and gradually disappears below the surface. The tail is what propels them to the bottom of the canyon and long after they have disappeared there is a smooth patch of water on the surface created by their tail propulsion. Wow! It is a fantastic sight and something I have wanted to see for a long time. I can now tick it off my bucket list. With the whale gone, and knowing it would be some time before it resurfaced again, the crew set about finding another. Every-so-often the captain would stand at the side of the boat, lower what looked like an alpenhorn into the water and listen through headphones for any sign of whales. They give off sonar signals which can be picked up, giving an indication as to which direction and how far away they are. 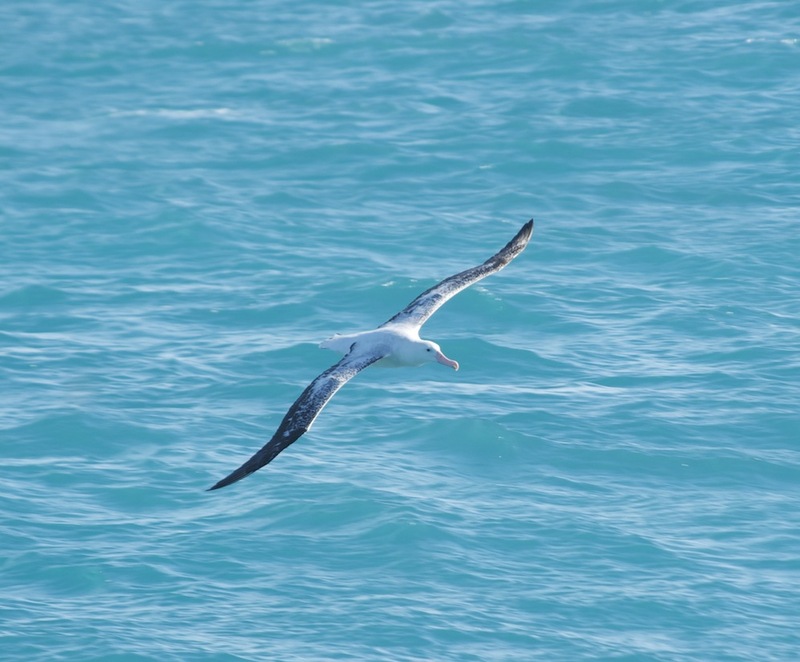 While this was going on we could be on deck enjoying watching the albatross swoop by, sometimes just centimetres above the surface of the water but never touching it. 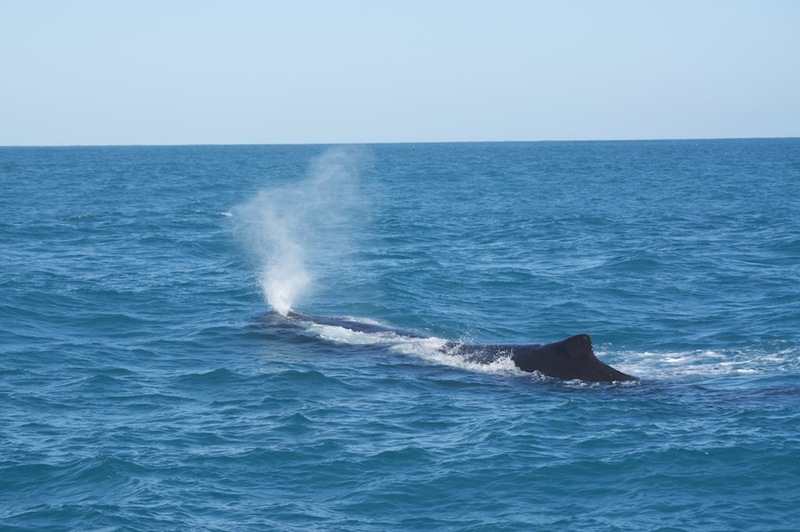 However, as soon as we had an indication of a whale, we were back in the cabin and racing off to find it. Some people were really struggling with the swell and quite a few were seasick. It struck me as an incredibly expensive trip if you spent all your time with your head in a sick bag, unable to leave your seat, and tragically unable to enjoy the spectacle of the whales, dolphins and seabirds. 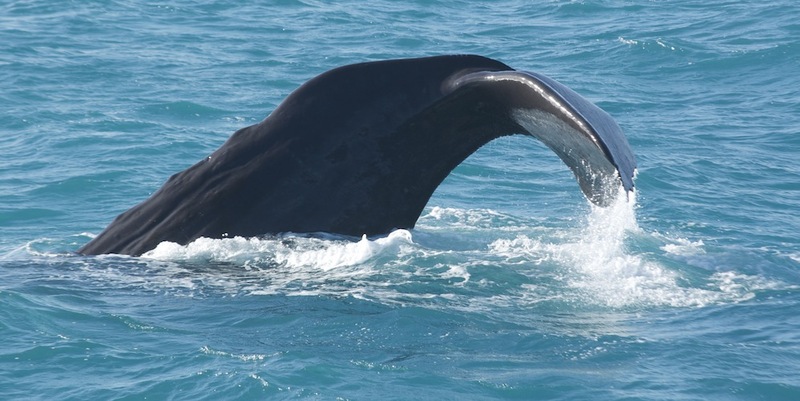 We found a second whale, one that has been resident in these waters for at least 21 years. He was about 19m in length. Like the first, he had surfaced to re-oxygenate his blood before diving again for food. Again, the crew readied us for the flick of the tail. This time we were more sideways on rather than towards the rear but it was still very special. All too soon for me, but not for those with their heads in sick bags, it was time to head back to shore. I was astonished how far we had travelled down the coast from Kaikoura, having lost all sense of direction while my eyes and mind were focused on enjoying the wild life. It was a thoroughly enjoyable trip, the crew were very professional and informative and we got the results we wanted. It was worth every cent. Adjacent to the whale centre their is Kaikoura Helicopters. Stephen and I decided to enquire about a flight. They also go whale watching but having already done that we chose to book the flight up to the top of Mt. Fyffe (1603m) for the following morning. Stephen, being a pilot, is fascinated by helicopters and is undecided as to whether to add this to his fixed wing license. I have flown in Nepal, as has Stephen, but Angela has never flown in one. It was weather dependent so we hoped we’d wake up to a clear morning. Before we returned to our motel we drove around the headland to the seal colony. Having been here two years ago we knew how unperturbed the seals were about humans. It has not changed. 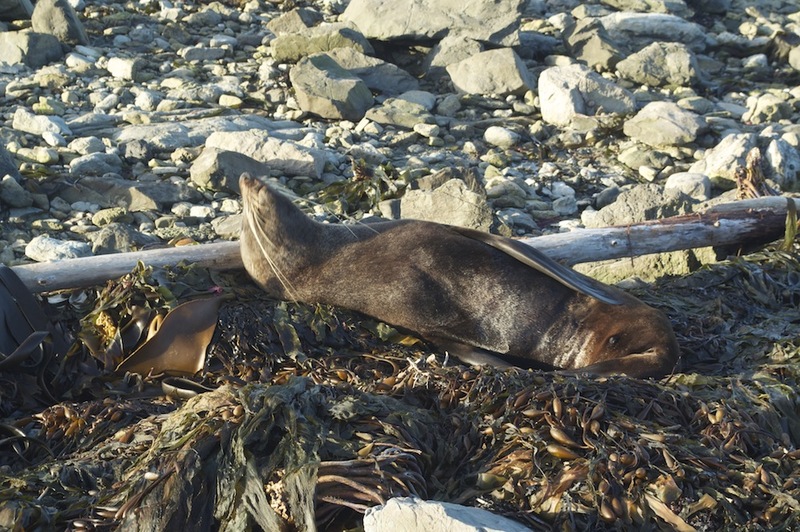 Seals lay sleeping next to the path among the natural debris of the beach, looking as if they were washed up on the last high tide. They are remarkably complacent. It is also a fascinating place just to witness the power of the ocean as the waves crash against the rocks of the headland. It is also a great place to come and see birds feeding in the pools among among the rocks. There was even a blue heron, which seemed out of place with such violent waters so close, while the variable oyster catchers seemed perfectly at home. The following morning dawned clear, with the promise of plenty of sunshine, so, as arranged, we went over to the helipad. Our pilot, Arron, seemed very young but was very capable. On taking off we ventured out over the sea, briefly, before heading inland towards Mt. Fyffe, which loomed dark ahead of us with a backdrop of snowy peaks behind. Arron talked to us all the time, pointing out things of interest and adding some background to the scene below and ahead of us. Behind us was a wall of snowy mountains with deeps gullies pointing down to deeper valleys below. There was a breeze and the temperature was in lower single figures. After fifteen minutes it was time to climb back into our helicopter and return to Kaikoura 1600m below. Mt. Fyffe is the easiest mountain top I have reached by a long way! 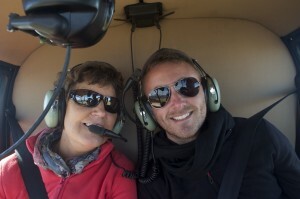 It was also, by far, the smoothest helicopter ride I have had and was an excellent introduction for Angela. I am sure she would jump at the chance if the opportunity came her way again. 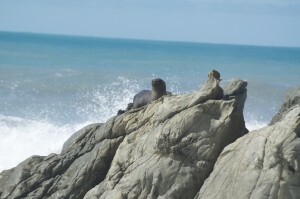 Having done everything we set out to do, and more, in Kaikoura, we hit the road again and headed inland for Hanmer Springs, a mountain resort with lots to offer.